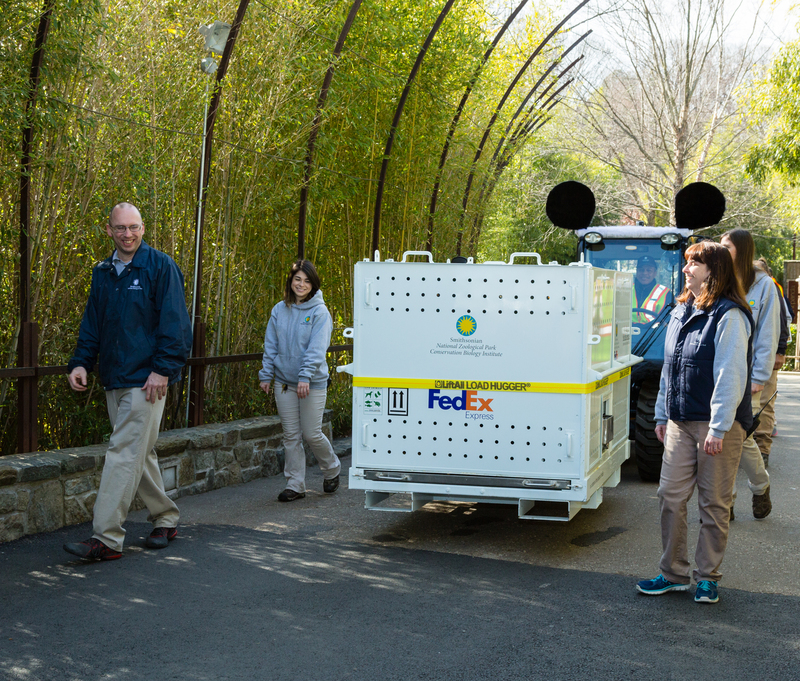 Bao Bao departs the Smithsonian’s National Zoo in her custom crate. To download videos of giant panda Bao Bao and Zoo staff interviews, see the B-roll for media playlist on YouTube. For photos, please see the Zoo's Flickr album. Bao Bao (BOW-BOW), the 3 ½ year-old giant panda, began her journey to China this morning. She departed the Smithsonian’s National Zoo at 10:35 a.m. for Dulles International Airport in northern Virginia where she will board a FedEx 777F plane bound for Chengdu, China. The non-stop flight will take about 16 hours. Bao Bao’s departure from the Zoo was broadcast via Facebook Live. Giant pandas are listed as “vulnerable” in the wild by the International Union for Conservation of Nature. There are an estimated 1,800 in the wild. The Smithsonian’s National Zoo and Conservation Biology Institute is a leader in giant panda conservation. Ever since these charismatic bears arrived at the Zoo in 1972, animal care staff and scientists have studied giant panda biology, behavior, breeding, reproduction and disease. These experts are also leading ecology studies in the giant pandas' native habitat. The Zoo’s giant panda team works closely with colleagues in China to advance conservation efforts around the world. Chinese scientists are working to reintroduce giant pandas to the wild.